It is eight years since Esmahan Abdaqadir Ali left the Somali capital Mogadishu for a new life in Saudi Arabia, and things have not quite turned out as planned. For a start, she never reached her destination. She was granted refugee status automatically upon arriving by boat in Yemen. Then she married, became pregnant and joined the ranks of Yemen’s semi-permanent Somali refugee community, estimated to number around 232,000 according to the UN Refugee Agency (UNHCR). “We’ve been through so much - we don’t think any longer about tomorrow - we are just thinking of how to live from one day to the next,” she told IRIN at a kindergarten in the southern city of Aden. As the mother of five young children, and now abandoned by her husband, she lives through begging - a common means of survival for Somalis, even those who have spent decades in what is the region’s poorest country. Yemen’s largest refugee community faces a dilemma; most Somalis, community leaders in the southern city of Aden say, would return home if given the chance. “Somali new arrivals have been down - as well as Ethiopians now. The situation in Somalia is getting better, and they know their chances of crossing into Saudi Arabia are much lower,” Saleh Hassan from the Danish Refugee Council (DRC) told IRIN. "We’ve been through so much - we don’t think any longer about tomorrow - we are just thinking of how to live from one day to the next"
In fact very few now seem to be making it across the border into Saudi Arabia as the country toughens its stance on illegal immigration, expelling hundreds of thousands of foreign workers, including Yemenis. The Saudis have tightened border controls and earlier this year announced plans to restart construction work on a more secure border fence. A delegation from the new Somali government visited Yemen in April, where they met UNHCR and discussed the possibilities for refugees to voluntarily return home once conditions in south and central Somalia improve further. At the moment, UNHCR supports some limited returns through a voluntary repatriation programme run by the International Organization for Migration (IOM) to Puntland and Somaliland in northern Somalia. But there is no comprehensive return package and volunteers need a security clearance from the authorities in the two Somali regions before travelling. The Arab Spring revolution and resulting instability in Yemen exacerbated the already difficult economic situation. Poverty rates increased from 35 percent in 2004 to 42 percent in 2009, and the 2011 political crisis led to a 12 percent drop in GDP, according to the International Monetary Fund. Across the Gulf of Aden, in Somalia, there have been occasional glimpses of hope that two decades of violence are coming to an end. In September 2012, MPs elected a new president - the first such election since 1967, and a move that helped bring a formal end to the transitional period. The African Union Mission to Somalia (AMISOM) and the Somali National Security Forces (SNSF) have extended their areas of control, and in January the US government recognized the Somali government for the first time since 1991. As a result of these changes, the numbers of Somalis making the dangerous sea crossing from the Horn of Africa has dropped in recent years from 27,350 in 2011 to 23,086 in 2012, according to UNHCR figures. 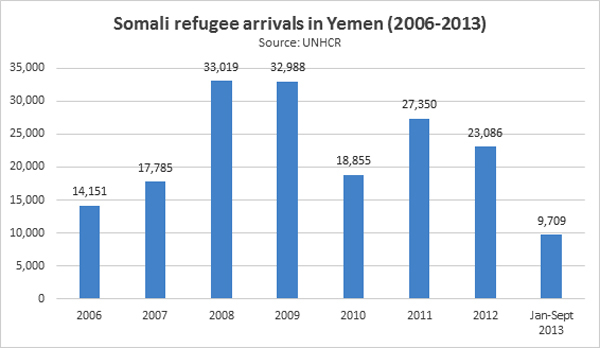 In the first nine months of 2013, 9,709 new Somali refugees were registered in Yemen. UNHCR started working in Yemen in 1987, and built up its work in the south from 1992 onwards as large numbers of Somali refugees started arriving. “Life is hard here. When people telephone from Somalia we tell them to stay there,” Sheik Absher Hassan Youssef, head of the Somali Community Council in Aden, told IRIN. The council has its offices in the Basateen area of the city. It is a shanty town district that is home to around 20,000 refugees, mainly Somali - one of the largest concentrations of urban refugees in Yemen (along with Sana’a and Mukalla). “Ten years ago life was easier, but with the economic crisis there’s no work here. There are no jobs. We’re paying rent. It creates conflict in couples because it’s such a struggle to live,” Youssef said. Some prefer life in the refugee camp at Kharaz, in the neighbouring governorate of Lahj, where nearly 17,000 mainly Somali refugees are based. There, life can be easier with food, education and shelter provided by UNHCR and their partners. In towns and cities there are more opportunities for Somalis to find work - cleaning houses, working on urban farms, and selling door-to-door (many Yemeni women spend most of their time indoors, hence the selling opportunity). But living conditions are often difficult for urban Somalis. Many split the costs of a rented house by sub-dividing homes into separate rooms, which each serve entire families - sometimes up to two parents and nine children, with all the families in the house sharing one bathroom. In Aden, several aid projects provide basic services for the community, including a centre for disabled children and a home for vulnerable children. Two of Esmahan’s children attend a kindergarten in Basateen, Aden’s poorest district, run by local NGO At-tadhamon. Nearly 350 mainly Somali children are looked after at the centre where they get daily meals and weekly outings to play in the park. 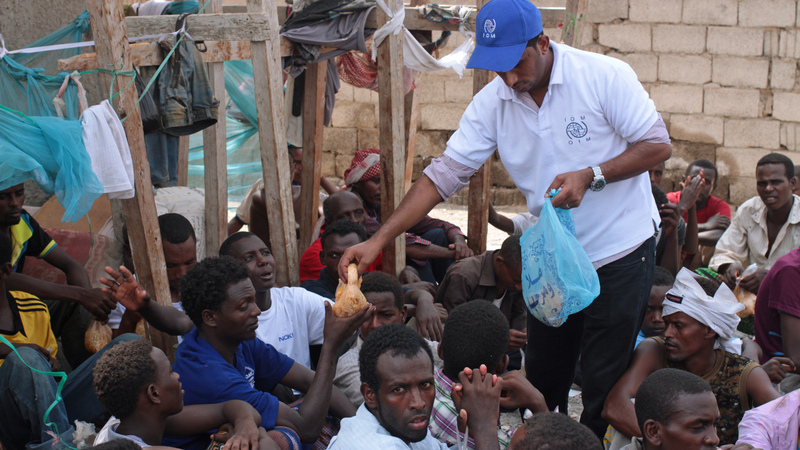 When new arrivals first come to Aden they often gather under a large tree in Basateen where the community provides them with temporary lodging where they can live for 10 days or so. Somali refugee Khadher Adam Hussein, now in his 30s, fled from just north of Mogadishu in 2003 and earns a few riyals washing cars for Yemenis. “When we came we couldn’t communicate with the Yemenis, but now I can get by. Things are very difficult and tough for the Somali community,” Hussein told IRIN. Hussein’s son was born in Yemen and unlike his parents speaks both fluent Arabic and Somali - a common pattern among the children of Somali refugees, who have never seen their parents’ home country, and have weaker ties to Somali culture. “When the parents came this was broken. The people who were born in Yemen, they need to know their culture,” said Nazeeh Ahmed Alwan, the field coordinator for the Adventist Development and Relief Agency (ADRA) in Aden. Those who fled Somalia as adults have struggled to move much beyond low level employment, but Yemeni-born Somalis with greater fluency in Arabic have been able to enter higher education and have more of a sense of belonging to Yemen, and far less of an attachment to Somalia. “There’s a big gap between those who came here and want to be buried back there, and those who were born here. We hope God grants us a return,” said Sheik Youssef. At Sara Mohamed Saeed’s kindergarten in Basateen three families in the last year left to return home, though she says she does not know if that is what they ended up doing. Those long-time resident Somali refugees with the energy to think about the long-term future still talk of returning home. However, new arrivals still come from Somalia, even if in lower numbers, and they remain keen to try and get into Saudi Arabia. Somalis seem less vulnerable, aid workers say, to the Yemeni kidnappers, often in league with smugglers, who pick up many of the Ethiopian migrants, considered more passive, shortly after they land in Yemen to extract a ransom through kidnapping and torture. But increased border controls in Saudi Arabia mean those stuck in border towns like Haradh have frequently had enough as well, and want to return. Next week the government of Yemen, in cooperation with UNHCR and IOM, is hosting a regional conference to draw up a strategy on how to improve refugee protection and better support Yemen manage the influx of migrants.